Otto’s is one of the best French restaurants London has to offer, as reviewed by the top food journalists and food critics in the UK. If you’re a fan of classic, elegant and romantic fine dining, then book to reserve a table at a top French restaurant in London. Enjoy fabulous food, a superb lunch and dinner service plus our wonderful international wine list. Otto’s French restaurant opened its doors at 182 Gray’s Inn Road, London WC1, 7 years ago and we quickly became renowned for our old-school, traditional, classic fine dining experience. We provide discreet service, fine wines and modernised classical French cuisine, using the freshest seasonal produce, and we’re proud to announce we’ve also been nominated in the World Restaurant Awards 2019. We’ve made the shortlist for Trolley of The Year at the World Restaurant Awards 2019! 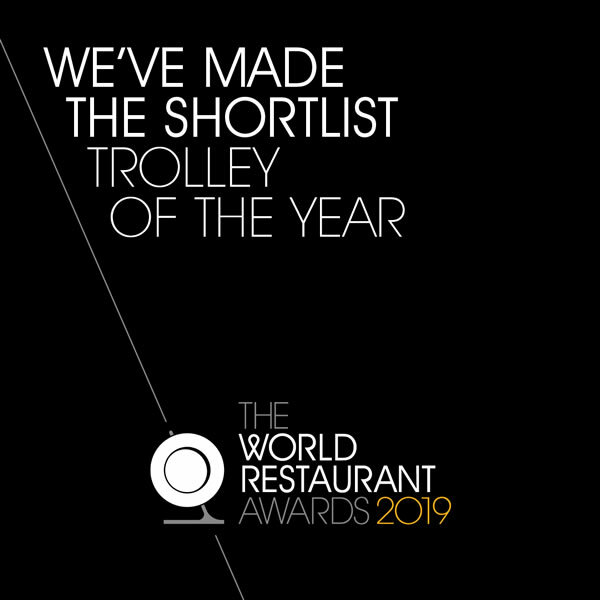 Otto’s French restaurant is proud to been selected from a huge number of international restaurants for The World Restaurant Awards 2019 shortlist for “Trolley of The Year”! Click below for more details. Our French restaurant is air conditioned & if you have any mobility issues please inform us when booking a lunch or dinner reservation.